I am someone who needs color on her plate. So while I love the crowd-pleasers at Thanksgiving 鈥� the mashed potatoes, the stuffing, the turkey 鈥� all of that beige has me pining for vibrant green beans and orange-hued winter squash. This extra-colorful wild rice pilaf is the answer. It鈥檚 glowing with dried cranberries, fresh herbs, and cubes of roasted butternut squash. Not only is it a perfect addition to the usual slew of sides, but it鈥檚 also hearty enough to be a great main dish for the vegetarians at the table. There鈥檚 just something about wild rice that feels so autumnal and festive. 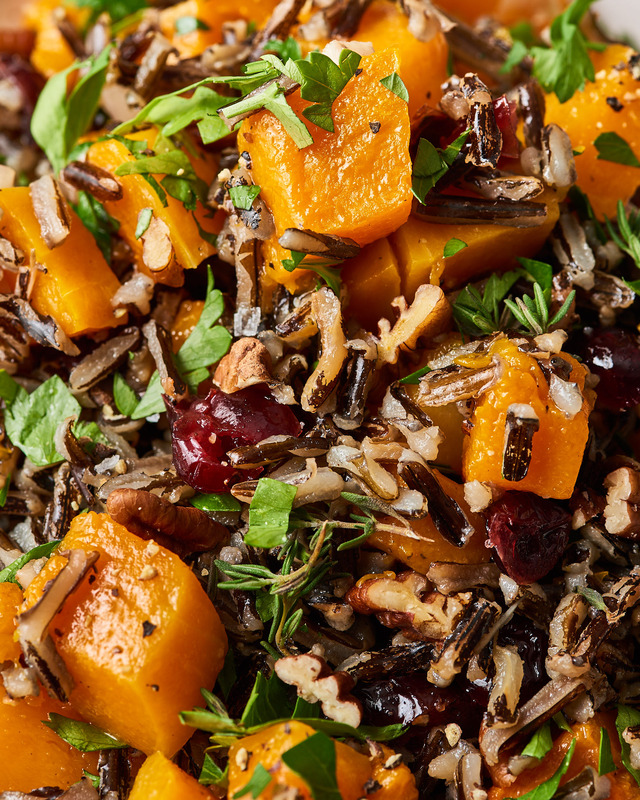 Its nutty, rich flavor is the perfect complement to sweet butternut squash and dried cranberries, while toasted pecans add crunch to the pilaf. 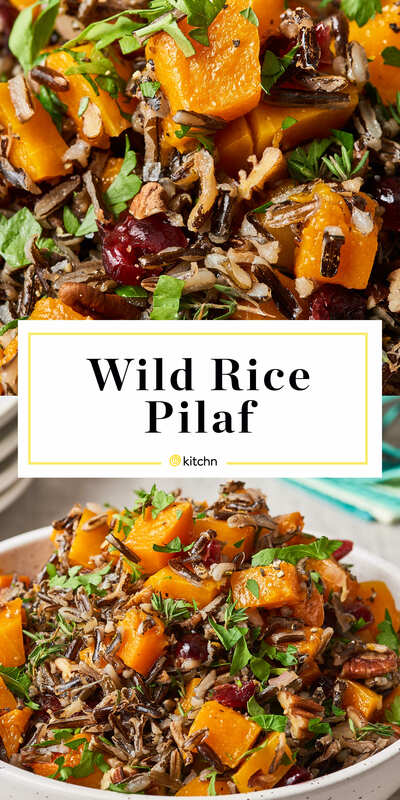 Wild rice also happens to be a good source of meatless protein, which makes this a great dish to have on the table for the vegetarians around it. The major components of this pilaf can be made ahead of time, too. Cook the rice and roast the squash a couple of days before Thanksgiving; then, before dinner, it鈥檚 simply a matter of rewarming rice and squash, saut茅ing the aromatics, and tossing everything together. Arrange a rack in the middle of the oven and heat to 425掳F. Place the wild rice in a fine-mesh strainer and rinse well under cold running water. Transfer to a large pot and add the water and 1/2 teaspoon of the salt. Bring to a boil over high heat, then lower the heat to maintain a simmer. Cover and simmer until the rice is chewy and some of the grains have burst open, 40 to 45 minutes. It may need an additional 10 to 15 minutes 鈥� keep checking the rice and stop cooking when the grains are tender. Meanwhile, roast the squash. Place the squash on a rimmed baking sheet. Drizzle with the oil and season with pepper and the remaining 1/2 teaspoon salt; toss to combine. Spread into a single layer. Roast, stirring occasionally, until the squash is tender and beginning to brown, 25 to 30 minutes. When the rice is done, pour it into a strainer to drain off any remaining liquid. Place the cranberries in a small bowl and cover with hot water. Set aside for 5 minutes to plump; drain. Return the saucepan used to cook the rice to the stove and melt the butter over medium heat. Add the shallot and thyme and saut茅 until soft and translucent, about 2 minutes. Remove from heat and stir in the rice. Gently fold in the squash, cranberries, pecans, and parsley. Taste and season with more salt as needed. Serve hot, warm, or at room temperature. 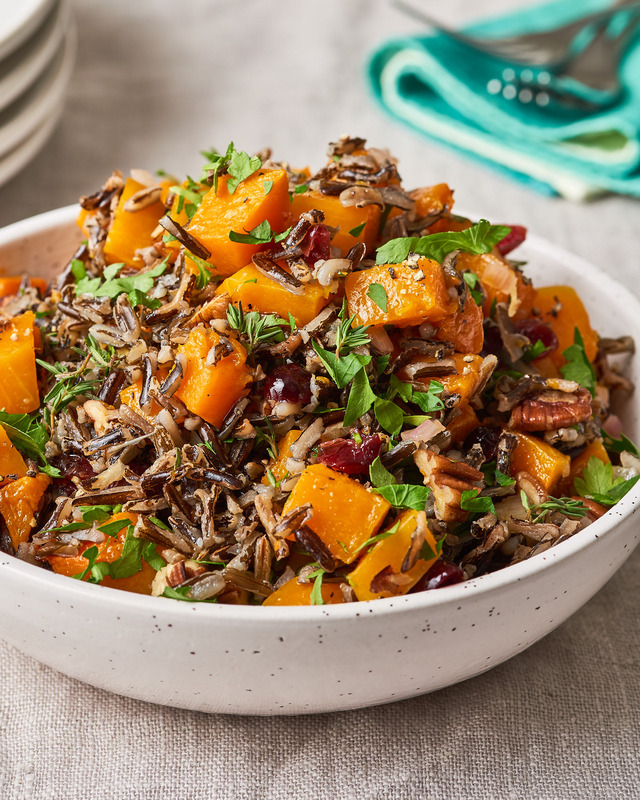 Make ahead: The wild rice and butternut squash can be cooked up to 2 days ahead and stored in separate airtight containers in the refrigerator. Rewarm briefly in the microwave if serving the pilaf hot. Otherwise, leave both out at room temperature for 20 minutes or so before proceeding with the recipe.